My nursery was designed for my twin girls, Jolie and Jacie. 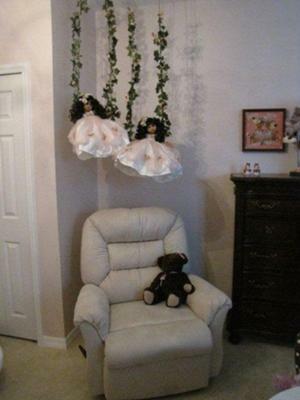 I wanted the nursery for my girls to be very girly, elegant, soft and cheerful. The furniture is cherry wood with beautiful detail and there are two cream colored chandeliers which I thought gave it its elegance. The soft colors of the room are a mauve pink, cream, and brown. The white of the room and the bright pink accent color make it cheerful. 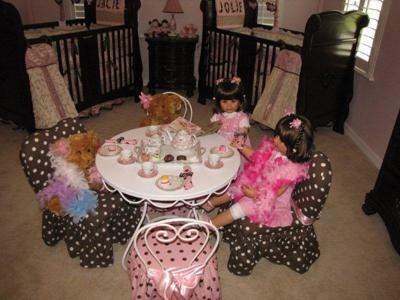 The tea party, the swings, the dolls and the dollhouse shelf give the room a real girly feel. 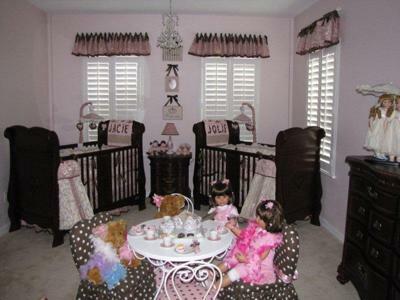 The nursery is centered around a tea party which is the focal point. I think all in all the nursery came together nicely and is truly a nursery fit for two precious girly girls. I have the same bedding for my twin girls I havent set it up yet but it looks gorgeous in your pictures ! !